For other universities with "Victoria" in their name, see Victoria University (disambiguation). 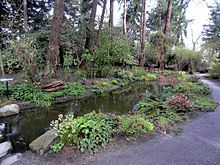 The University of Victoria (UVic) is a major public research university located in the Greater Victoria municipalities of Oak Bay and Saanich, British Columbia, Canada. The University of Victoria is the oldest post-secondary institution in British Columbia, tracing its roots back to Victoria College which was founded in 1903, under the sponsorship of McGill University. The university has approximately 22,000 students, including many post-graduate and doctoral candidates. The university operates nine academic faculties and schools; the Peter B. Gustavson School of Business, and the Faculties of Education, Engineering, Fine Arts, Human & Social Development, Humanities, Law, Science, and Social Sciences. "A multitude of the wise is the health of the world"
Based in the capital of British Columbia, the university has educated many prominent public figures, including Jody Wilson-Raybould, Rona Ambrose, and Russell Brown. Other alumni from the university includes founders of many prominent technology companies in recent years, including Flickr, Slack, and Hootsuite. The University of Victoria has also produced several Rhodes and Gates Scholars in recent years, and its alumni and faculty have worked on Nobel Prize winning research teams. It is the nation's lead institution in the VENUS and NEPTUNE deep-water seafloor observatory projects. The University has been home to more than 40 faculty Fellows of the Royal Society of Canada. The university also holds one of the largest financial endowments in British Columbia, and receives a significant portion of federal research funds each year. The University of Victoria is the oldest post-secondary institution in British Columbia, established in 1903 as an affiliated college of McGill University before gaining full autonomy through a charter on July 1, 1963. Victoria College, which had been established in 1903 as an affiliated college of McGill University, gained autonomy and full degree granting status on March 1, 1963. The non-denominational university had enjoyed 60 years of prior teaching tradition at the university level as Victoria College. This 60 years of history may be viewed conveniently in three distinct stages. Between the years 1903 and 1915, Victoria College was affiliated with McGill University, offering first- and second-year McGill courses in Arts and Science. Administered locally by the Victoria School Board, the College was an adjunct to Victoria High School and shared its facilities. Both institutions were under the direction of a single Principal: E.B. Paul, 1903–1908; and S.J. Willis, 1908–1915. The second incarnation of Victoria College, was originally housed in Craigdarroch Castle. The opening in 1915 of the University of British Columbia, established by Act of Legislature in 1908, obliged the college to suspend operations in higher education in Victoria. University of British Columbia was created in 1908. A single, public provincial university, it was modeled on the American state university, with an emphasis on extension work and applied research. The governance was modeled on the provincial University of Toronto Act of 1906 which established a bicameral system of university government consisting of a senate (faculty), responsible for academic policy, and a board of governors (citizens) exercising exclusive control over financial policy and having formal authority in all other matters. The president, appointed by the board, was to provide a link between the two bodies and to perform institutional leadership. In 1920, as a result of local demands, Victoria College began the second stage of its development, reborn in affiliation with the University of British Columbia. Though still administered by the Victoria School Board, the college was now completely separated from Victoria High School, moving in 1921 into the magnificent Dunsmuir mansion known as Craigdarroch Castle. Over the next two decades, under Principals E.B. Paul and P.H. Elliott, Victoria College built a reputation for thorough and scholarly instruction in first- and second-year arts and science. It was also during this period that future author Pierre Berton edited and served as principal cartoonist for the student newsletter, The Microscope. Between the years 1921-1944, the enrollment at Victoria College did not very often reach above 250. However, in 1945, 128 servicemen returned from World War II. This pushed enrollment up to 400, and in 1946; 600. Victoria College moved to the Provincial Normal School's Lansdowne campus in 1946. The institution later moved to Gordon Head area in 1967, four years after it became a university. The final stage, between the years 1945 and 1963, saw the transition from two-year college to university, under Principals J.M. Ewing and W.H. Hickman. During this period, the college was governed by the Victoria College Council, representative of the parent University of British Columbia, the Greater Victoria School Board, and the provincial Department of Education. Physical changes were many. In 1946 the college was forced by postwar enrollment to move from Craigdarroch to the Lansdowne campus of the Provincial Normal School, the current location of Camosun College's Lansdowne Campus. The Normal School, itself an institution with a long and honourable history, joined Victoria College in 1956 as its Faculty of Education. Late in this transitional period (through the co-operation of the Department of National Defence and the Hudson's Bay Company) the 284-acre (1,1 km²)--now 385-acre (1.6 km²)--campus at Gordon Head was acquired. Academic expansion was rapid after 1956, until in 1961 the college, still in affiliation with UBC, awarded its first bachelor's degrees. In the early part of this century, professional education expanded beyond the traditional fields of theology, law and medicine. Graduate training based on the German-inspired American model of specialized course work and the completion of a research thesis was introduced. The policy of university education initiated in the 1960s responded to population pressure and the belief that higher education was a key to social justice and economic productivity for individuals and for society. The university gained its full autonomy in 1963 as the University of Victoria. The University Act of 1963 vested administrative authority in a chancellor elected by the convocation of the university, a board of governors, and a president appointed by the board; academic authority was given to the senate which was representative both of the faculties and of the convocation. University of Victoria's Arms were registered with the Canadian Heraldic Authority on April 3, 2001. The historical traditions of the university are reflected in the coat of arms, its academic regalia and its house flag. The BA hood is of solid red, a colour that recalls the early affiliation with McGill, as do the martlets in the coat of arms. The BSc hood, of gold, and the BEd hood, of blue, show the colours of the University of British Columbia. Blue and gold have been retained as the official colours of the University of Victoria. The motto at the top of the Arms of the University, in Hebrew characters, is "Let there be Light"; the motto at the bottom, in Latin, is "A Multitude of the Wise is the Health of the World." With a total area of 403 acres (163 ha) on its main site alone, the University of Victoria campus is one of the largest campuses in North America. The campus lies on the border between the municipalities of Oak Bay and Saanich, divided almost perfectly down the centre of campus (with the northeast half being located in Saanich and the southwest half in Oak Bay). This municipal boundary is marked and commemorated by undermount plates and a bronze line near the main quadrangle. Despite its name, no part of the university's main campus is located in the City of Victoria proper. 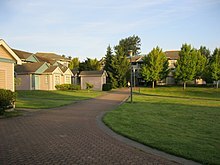 The campus is several hundred feet from the Pacific Ocean at Cadboro Bay. The campus of the University of Victoria was originally designed by American architectural firm of Wurster, Bernardi & Emmons, which had previously achieved fame for having completed major buildings at Stanford University and UC Berkeley. The principles and concept of the original design are still being followed, with the academic portions of the campus located inside the Ring Road, forming a perfect circle 600 m (1,969 ft) in diameter. This academic ring is a distinctive feature of the University of Victoria and was intended to foster interaction, intellectual sharing, and collaboration. The area outside of Ring Road hosts important parts of the university, including the residential colleges (now residence halls), Student Union Buildings, sports facilities, as well as some of the newer academic facilities which have expanded outwards in recent years (The Faculties of Law and Theatre for example). Administrative Services Building – Accommodates the university's executive team as well as other administrative functions such as accounting, research services, pension, and payroll. Bob Wright Centre – Home to the School of Earth & Ocean Sciences, the Department of Chemistry, and the Canadian Centre for Climate Modelling & Analysis (CCCMA). Also features the Department of Astronomy dome and telescopes, lecture theatres, offices, meeting rooms, labs, and SciCafe dining outlet. Business and Economics Building – Besides the obvious, the Business and Economics building also houses the offices of senior university administrators and contains a student computing facility. Clearihue Building – Organized around a central court (or quadrangle), it is home to the Faculty of Humanities, houses the Departments of English, French, Germanic and Slavic Studies, Greek and Roman Studies, Hispanic and Italian Studies, History, Linguistics, Medieval Studies, Pacific and Asian Studies, Philosophy, and Gender Studies. Contains numerous classrooms as well as student computing facilities, including the Computer Assisted Language Learning (CALL) facility and the Computer Help Desk. It is the location of the Department of University Systems, which is largely responsible for the systems, networking and support of the university, including student computing facilities and language labs. 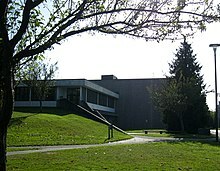 Clearihue is the oldest building on campus, originally constructed in 1962 and augmented by an addition in 1971. It is named after Joseph Clearihue, who was chairman of Victoria College from 1947 until it gained university status in 1963. In 2013, the Clearihue Building underwent a major $15 million redevelopment. Cornett Building – A sprawling complex of different courts and staircases, which includes classrooms and houses the Departments of Anthropology, Psychology, and Sociology. Cornett building is often described by freshmen undergraduates as being a unrelenting maze. The Cunningham Building houses the Department of Biology as well as the Centre for Forest Biology. Cunningham – Contains the Department of Biology, the Centre for Forest Biology, a herbarium, and numerous specialized research facilities. CARSA Building – CARSA is the new Centre for Athletics, Recreation and Special Abilities on the UVic campus. It houses the UVic Vikes athletics and recreation programs in state-of-the-art facilities, as well as offices, labs and a machine shop for CanAssist, which develops customized technologies, programs and services for people living with disabilities. David Strong Building – Contains classroom spaces, including seminar rooms, breakout rooms, and the Mathews and McQueen auditorium. David Turpin Building – The David Turpin Building is best known as the home of the UVic Department of Political Science, one of the largest and best known faculties at the University of Victoria. The building also includes the School of Environmental Studies, Statistics, and Mathematics. The Turpin Building also hosts the government-funded Water & Climate Impacts Research Centre (W-CIRC). It includes a grass roof and high-quality LEED energy efficient engineering. Elliott – Includes the Departments of Chemistry and Physics and Astronomy, as well as a number of offices, classrooms, and laboratories. The building is topped by the Climenhaga Observatory. Engineering Buildings – Includes the Engineering Office Wing (EOW), the Engineering Lab Wing (ELW) and the Engineering/Computer Science building (ECS). Home to the Faculty of Engineering, which includes the Departments of Biomedical Engineering, Civil Engineering, Computer Science, Electrical and Computer Engineering, Mechanical Engineering and Software engineering. Fine Arts – Contains the departments of Writing and History in Art as well as many offices, classrooms, a major lecture theatre, a photography darkroom, Arts Place dining outlet, and a multi-purpose lobby that may be used for readings and performances. First Peoples House serves as a cultural, social, and academic centre for indigenous students at the university. First Peoples House – Anthropological building that provides a welcoming home-away-from-home for Indigenous students. Features two large statues in front of the modern, glass building. It is located between Centre Quadrangle and West Quad. Fraser Building – Formerly known as the Begbie building. Houses the Faculty of Law and the Institute for Dispute Resolution. The building also contains classrooms, seminar rooms, a moot courtroom, and the Diana M. Priestly Law Library. Halpern Centre for Graduate Students – Colloquially known as "The Grad Centre", the building houses the Graduate Student Society (GSS) general office, the "Grad House" restaurant, which is open to the public, and the David Clode lounge. There is also a meeting space (boardroom) that can be booked by contacting the GSS Office. Hickman Building – Formerly called the Centre for Innovative Teaching. Includes "Smart" classrooms featuring closed-circuit cameras and remote projection systems to link teachers and students with classrooms at remote locations. Human and Social Development Building – Classrooms and offices for Child and Youth Care, Dispute resolution, Health Information Science, Indigenous Governance, Nursing, Public Administration, and Social Work. 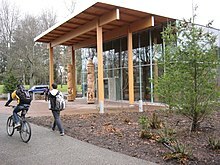 Ian Stewart Complex – One of UVic's recreational facilities. Includes tennis courts, squash and raquetball courts, an ice rink, an outdoor pool, a dance studio, a physiotherapy clinic, a gym, and a weight room. Also contains the Alumni Services, Development, Corporate Relations, and Advancement Services departments. Currently being redeveloped as part of a major expansion to house more post-graduates and international students. 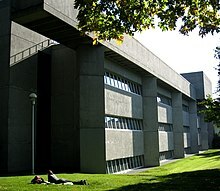 MacLaurin Building – An extensive modernist complex which includes the Faculty of Education and School of Music, as well classrooms, the David Lam Auditorium, the Curriculum Library, and Mac's Bistro. McKinnon Building – Encompasses the School of Exercise Science, Physical and Health Education, an indoor swimming pool, fitness and weight room, dance studio, outdoor tennis courts, squash courts and a gymnasium. 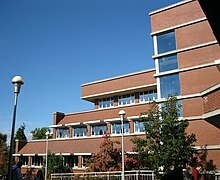 McPherson Library and William C. Mearns Centre for Learning - The McPherson Library is the major research library of the University of Victoria. It houses University of Victoria extensive holdings, including the university archives, special collections, and map library. Following a major donation, the 2008 expansion to the McPherson Library created the William C. Mearns Centre for Learning, which contains the state-of-the-art Learning Commons, Media Commons, International Centre, classrooms, and several group study rooms. 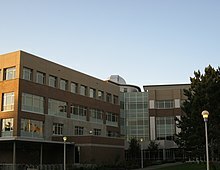 Medical Sciences Building – The home of Island Medical Program, the future home of the University of Victoria Medical School. Petch Building – the Department of Microbiology and Biochemistry, and School of Earth and Ocean Sciences. Sidgwick – An Advanced Research Complex which houses the Centre for Asia-Pacific Initiatives (CAPI), Centre on Aging, Centre for the Study of Religion in Society, Centre for Global Studies; as well as fundraising and administration offices. Student Union Building – popularly known as the "SUB", it houses a movie theatre, many restaurants, a stationary stores, several book vendors, and the headquarters of several clubs, societies, and campus organizations, including the University of Victoria radio station (CFUV). There is also a large student bar located in the SUB, known as Felicita's Campus Pub. University Centre – A major complex with a distinctive copper-roof at the centre of campus and adjacent to West Quad. It includes the Registrar's Offices, as well as many administrative departments (Admissions, Accounting, Payroll, Academic Advising, Career Services), the main public restaurant, and the Farquhar auditorium. 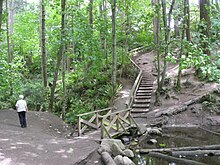 The Mystic Vale is a forested ravine acquired by the university in 1993. The university offers on-campus housing for over 3,200 students. A variety of housing is available, including single and double dormitories, Cluster Housing (apartment-style housing with four people per unit), bachelor and one-bedroom apartments, and family housing. Four buildings in one of the oldest residential complexes at the university are named for Emily Carr, Arthur Currie, Margaret Newton, and David Thompson. Construction on the South Tower Complex was completed in January 2011. The largest residence building in terms of capacity is Ring Road Hall, which holds 294 beds and is split into three wings. The campus has become increasingly cycling-friendly. Much of the university estate and endowment lands have been preserved as a nature setting, notably Finnerty Gardens and Mystic Vale, a 4.4 ha (11 acres) forested area and park. The large campus is home to deer, owls, squirrels and many other wild animals native to the area. A large population of domestic rabbits was a feature of the campus previously. In May 2010, the university began trapping and euthanizing the rabbits as they had been known to put athletes at risk in the playing fields and cause extensive damage to university grounds. Local veterinarians offered to perform neutering of the male rabbits. As of July 2011, the UVic campus is free of rabbits. 900 rabbits were saved and sent to shelters. The majority of rabbits moved to shelters died between 2011 and 2016, after which the remaining survivors (147 rabbits) were relocated to a private sanctuary in Alberta. McPherson Library is one of three libraries in the University of Victoria Libraries system. The University of Victoria Libraries system is the second largest in British Columbia, being composed of three 'on-campus' libraries, the William C. Mearns Center for Learning/McPherson Library, the Diana M. Priestly Law Library, and the MacLaurin Curriculum Library. The Library System has undergone significant growth in recent years thanks to the University's investment in library purchases and research. Amongst the highlights in the University of Victoria Archives and Special Collections are priceless items from Imperial Japan, to carbon dated original manuscripts of the Sancti Epiphanii. The collection also includes extensive histories of colonial Victoria and the Colony of Vancouver Island among other documents. The library's digitization programme is becoming increasingly active in making materials available. Renovations and new construction over the past decade have included special collections classrooms, an innovative Learning Commons and an art gallery. The UVic libraries collection includes extensive digital resources, over 2.0 million books, 2.3 million items in microforms, plus serial subscriptions, sound recordings, music scores, films and videos, and archival materials. The University of Victoria houses the Education Heritage Museum, which displays educational history artifacts in the main hallway of the MacLaurin building. The collection consists of manuscripts, texts, photographs, audio-visual material, lesson plans, posters, bells, ink bottles, fountain pens, desks, maps, athletic clothing, photographs, and school yearbooks used in kindergarten to grade 12 schools in Canada from the mid-1800s to the 1980s. The University of Victoria has two art collections (University and Maltwood) which host loan exhibitions, and exhibits of the works of students and faculty in the University Centre Exhibition Gallery. The University Collection, founded in 1953 by Dr. W.H. Hickman, Principal of Victoria College (1953-1963), consists of 6,000 works, mainly by contemporary artists practicing in British Columbia. The Maltwood Art Museum and Gallery, founded through the bequest of English sculptress and antiquarian, Katharine Emma Maltwood, F.R.S.A. (1878-1961), reflects her and her husband John Maltwood's taste. The collection of 12,000 works of fine, decorative and applied arts includes Oriental ceramics, costumes, rugs, seventeenth century English furniture, Canadian paintings and Katherine Maltwood's own sculptures. The Legacy Gallery in downtown Victoria is one of several off-campus properties owned by the university. The University of Victoria has acquired a portfolio of properties around Victoria, British Columbia and across Vancouver Island. These include the Legacy Gallery in downtown Victoria, the University Club, the Inter-urban campus, a former Saanich-based lodge and retreat, the Swans Hotel and Restaurant complex, and the Queenswood Property. The large, partially forested Queenswood property has been proposed as a site of future expansion for the university. In 2017, the University of Victoria announced plans to develop a downtown campus/accommodation centre in the historic area of Victoria, BC including accommodation for students and other facilities. The new downtown campus will be centered in buildings donated to the university and located around the historic Broad Street area, beside the old Bay Centre. The downtown development has been suggested as a possible future home for UVic's Peter B. Gustavson School of Business. The UVic endowment (estimated at $374 million) and large private donations have allowed for the university's estate to continue growing and for facilities to be upgraded and expanded on an ongoing basis. Below is a list of undergraduate faculties, departments, and schools within the University of Victoria system. UVic also offers a number of interdisciplinary undergraduate programs, including Applied Ethics, Arts of Canada, European Studies, Film Studies, Human Dimensions of Climate Change, Indigenous Studies, Latin American Studies, Social Justice Studies, and Technology and Society. The Peter B. Gustavson School of Business is located at the university's Business and Economics Building. The Peter B. Gustavson School of Business, formerly the Faculty of Business, was renamed following a donation by local entrepreneur Peter B. Gustavson. This business school offers a wide range of programs including the BCom, MBA and other business degrees, EQUIS and AACSB accredited. The program starts with two years of general studies (with 5 required classes) and then the 3rd and 4th year are business intensive. Three co-op work terms are also required. The Faculty of Engineering admits approximately 400 students into first-year programs each year. Students can specialize in the following disciplines: Biomedical Engineering, Civil Engineering, Computer Engineering, Computer Science, Electrical Engineering, Mechanical Engineering, and Software Engineering. The Faculty of Fine Arts splits into five different departments: Art History and Visual Studies, the School of Music, Theatre, Visual Arts and Writing. UVic's Department of Art History and Visual Studies has a long tradition of scholarship in the areas of Islamic art, South and Southeast Asian art, and Native arts of North America. It is one of few schools that has traditionally held two chairs of Islamic art, most recently filled by Anthony Welch and Marcus Milwright. 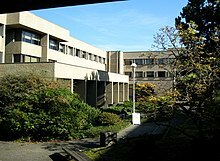 The offices of the Faculty of Humanities, and its departments, are located in Clearihue Building. The Faculty of Humanities consists of ten departments (English, French, Genders Studies, Germanic and Slavic Studies, Greek and Roman Studies, Hispanic and Italian Studies, History, Linguistics, Pacific and Asian Studies, and Philosophy), as well as three Programs (Latin American Studies, Medieval Studies, and Religious Studies). The faculty offers certificates, minors, and majors leading to both BA and BSc degrees, as well as MA and PhD degrees. Languages, narratives, philosophies, histories—the Faculty of Humanities brings these all together in a critical context of analysis, interpretation, research, and communication. The UVic Faculty of Law is consistently ranked as one of the best and most-applied to law schools in Canada. It offers a hands-on work experience program for young lawyers and an intensive environmental law program, featuring a course at Hakia Beach, BC in association with the Tula Foundation. UVic Law has been deeply involved with many Aboriginal, ecological, and environmental cases in British Columbia, and continues this tradition today. The School of Earth & Ocean Science is located in the Bob Wright Centre. The university's School of Earth & Ocean Sciences, within the Faculty of Science, has produced a large number of influential findings in its history. The School of Earth & Ocean Science also collaborate with the VENUS and NEPTUNE research institutes. The university was a founding member of the Western Canadian Universities Marine Sciences Society. UVic maintains this field station on the west coast of Vancouver Island, which is jointly run by the University of British Columbia, Simon Fraser University, the University of Alberta and the University of Calgary. The UVic School of Public Administration specializes in its M.A., and PhD. programs but also offers a selective admission minors program for political leaders and mid-career civil servants. Continuing education has been an integral part of the University of Victoria since its inception in 1963. Today, the Division of Continuing Studies provides adult and continuing education programming in co-operation with UVic faculties and community partners. The Division of Continuing Studies offers a comprehensive portfolio of programs in a range of academic disciplines, using diploma, certificate and other programming models to serve adult, part-time and internationally dispersed students. Business, The Gill School of Business. 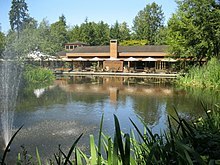 The UVic Gill Business School is known for its particular focus on International Business and Energy. Political Science, includes a multi-disciplinary approach involving Economics, Geography, and Law. Humanities, which includes English, French, Germanic and Slavic Studies, Greek and Roman Studies, Hispanic and Italian Studies, History, Linguistics, Pacific and Asian Studies, and Philosophy. The history department has a reputation for Digital History. UVic's Graduate programs range from individual interdisciplinary programs to graduate research programs. The university also offers students specialized degree options and doctoral options. Admission to the University of Victoria is based on a selective academic system and is highly competitive. Each year, the university receives far more applications than there are spaces available, making it one of the most applied to institutions in Canada. Applicants are required to submit applications with their grade points average (GPA) and personal statements in order to be considered for admission. The university may also accept qualified applicants studying under IB programs, AP programs or other international distinctions. Given its endowment, the University of Victoria is able to offer scholarships and financial aid to a large number of students. The University of Victoria is one of the most international universities in Canada and has partnered with a number of research institutions to provide UVic students with the opportunity to gain valuable research experience abroad. International conferences and study abroad opportunities are encouraged for all students, with many students completing a gap year before commencing their studies. Both UVic undergraduate and graduate students may travel abroad with UVic's many partner universities. This international exchange program develops the collegial yet international atmosphere at the University of Victoria, and promotes an exchange of information. The University of Victoria has partnered with high-ranking institutions around the world, including Sciences Po, University of London, University of Washington, Hong Kong University, Utrecht University, and the National University of Singapore. The University of Victoria has ranked in a number of post-secondary rankings. In the 2018 Academic Ranking of World Universities rankings, the university ranked 301–400 in the world and 13–18 in Canada. The 2019 QS World University Rankings ranked the university 359th in the world, and 14th in Canada. The 2019 Times Higher Education World University Rankings ranked the university 301–350 in the world, and 15th in Canada. In the 2019 U.S. News & World Report Best Global University Ranking, the university ranked 272nd in the world, and 10th in Canada. The Canadian-based Maclean's magazine ranked the University of Victoria second in their 2019 Canadian comprehensive university category. Along with academic and research-based rankings, the university has also been ranked by publications that evaluate the employment prospects of its' graduates. In the Times Higher Education's 2018 global employability ranking, the university ranked 200–250 in the world, and 8–9 in Canada. "Graduate employability: top universities in Canada ranked by employers 2018". Times Higher Education. TES Global. 14 November 2018. Retrieved 21 November 2017. </ref> In QS's 2019 graduate employability ranking, the university ranked 301–500 in the world, and 10–17 in Canada. In 2018, Research Infosource named the University of Victoria the 19th best research university, with a sponsored research income of $114.922 million, and an average research income of $170,000 per faculty member in 2017. The university's research performance has been noted in several bibliometric university rankings, which uses citation analysis to evaluate the impact a university has on academic publications. In 2018, the Performance Ranking of Scientific Papers for World Universities ranked the university 372nd in the world, and 16th in Canada. The University Ranking by Academic Performance 2018–19 rankings placed the university 370th in the world, and 17th in Canada. The University maintains a field station on the west coast of Vancouver Island to conduct marine research. The facility is jointly run by the University of British Columbia, Simon Fraser University, the University of Alberta and the University of Calgary. Undergraduates at the University of Victoria have full access to research and learning at this facility. In 2011 the university, in collaboration with the provincial government purchased and modified a state of the art ocean vessel capable of launching 'deep sea submersibles' and conducting long-range marine biology research expeditions. The 'floating laboratory' is undergoing upgrades and expansions currently and was scheduled to be in service by late 2011. The School of Earth & Ocean Sciences is also home to the renowned VENUS and NEPTUNE research institutes responsible for seismic, oceanic and climate change research. Located in the Greater Victoria area the University's legal centre provides free legal assistance to the disadvantaged as well as dealing with important environmental cases in British Columbia. The UVic Law Center is the only full-time, term clinical program offered by a Canadian law school. The program reflects the faculty's emphasis on integrating legal theory, legal skills, and community service while providing students with unique education and research opportunities. Located in the Greater Victoria, British Columbia area the Vancouver Island Technology Park is a state of the art, 35 acre commercial research facility. It is the largest university-owned technology centre in BC. The venture allows the university to work with leading technology and biomedical companies while provided students with unparalleled research opportunities. The facility focuses on fuel cell, new media, wireless, and life science/biotechnological research. The UVic Genome BC Proteomics Centre and a number of other research institutes are based out of the research park. The Capital Regional District is a major commercial hub for technology companies. Several fraternities, sororities, and secret societies exist on the University of Victoria, despite the fact that the Students' Society does not recognize fraternities, sororities, or societies on the basis that they, by definition, seek to exclude portions of the membership. This issue continues to be a key debate in student politics at the University of Victoria. The international fraternity Delta Kappa Epsilon chartered the Beta Tau chapter in 2010, currently estimated at 150 members. The international sorority Kappa Beta Gamma chartered a chapter in 2011, currently estimated at 100 members. The local sorority, Alpha Chi Theta, was chartered in 2013, and is currently estimated at 55 members. The Omega chapter of Phrateres was installed in 1961. CFUV is a long-standing campus radio station focusing on the campus and the surrounding community. CFUV serves Greater Victoria at 101.9, and via cable on 104.3, Vancouver Island and many areas in the Lower Mainland and northwestern Washington state. CFUV is closely associated with the Martlet and has a 'cult following' of committed fans in Victoria, British Columbia. Many of Canada's top broadcasters and news anchors have worked with the CFUV since the radio station was established. The CFUV actively promotes the campus experience and plays a large role in UVic's annual 'Weeks of Welcome'. The university's cluster neighbourhood comprises 121 apartments and townhouses for student living. The University of Victoria maintains several residence halls on campus, which were originally based on the Oxbridge Collegiate model of constituent colleges which serve as a smaller, more personal home environment to the students of the wider university. The University no longer operates these halls as individual colleges, but rather as halls of residences (as well as dormitories and apartments) as part of the Residence Life and Education department. Today, all halls of residence are equipped with Common Rooms and high-speed internet for students. Most UVic students live on campus or within a few blocks of the main site, leading to a close feeling of community. The oldest and most famous of these residence halls is Craigdarroch, which features large stone-clad buildings and ivy covered walkways and courtyards. The modernist Lansdowne Halls feature six buildings connected by a series of bridges, walkways, and tunnels, including the popular 'UVic Underground'. Gordon Head and Ring Road Hall feature modern rooms and amenities for students, organized around a series of large courtyards. In the centre of the Residence Village is the Cadboro Commons and a number of restaurants operated by the university, where students may eat and study. The Residence Halls provide a picturesque and grounding home for students. A mixture of dorms, single rooms, apartments, cluster studios, and family housing are available but decided by lottery system. First year students are guaranteed accommodation in one of the Residence Halls of campus. UVic's oldest and most recognized weekly student newspaper, founded in 1948, is The Martlet. It is distributed all over campus and the Greater Victoria area. The paper is named after the legendary martlet bird, whose inability to land is often seen to symbolize the constant quest for knowledge, learning, and adventure. The Martlet is partly funded by student fees. The Martlet is the only independent campus newspaper at the University of Victoria, and therefore one of the only publications that has the time and resources to fully hold both the University of Victoria and the University of Victoria Students' Society (UVSS) accountable. The Martlet regularly reports on UVic Board of Governors and Senate meetings, as well as University of Victoria Students' Society Board meetings and elections. Today, The Martlet has a wide circulation and can be found in coffee shops, theatres, grocery stores, offices, and street corners throughout Victoria, British Columbia. The newspaper maintains its strong editorial line and commitment to politics and activism. Many national journalists and columnists in Canada have gotten their start in writing journalism at The Martlet and it continues to produce opportunities for student writers to become professionals. Notable Martlet alumni include Andrew MacLeod of the Tyee, Victoria Mayor Lisa Helps, and Leader of the B.C. Green Party Andrew Weaver. In recent years, The Martlet has broken stories about UVSS spending deficits, UVic's reputational enhancement project, divestment lobbying efforts by UVic student activists, issues with UVic's sexualized violence policy, the arrival of Starbucks on campus, problems in the UVic Sociology department, international student tuition hikes, student groups' support of the Unist'ot'en First Nation camp, pro-life vs. pro-choice protesters on campus, racism and antisemitism on campus, and the ongoing battle for UVic student Lilia Zaharieva to receive her life-saving medication for her cystic fibrosis. The Martlet is currently undergoing a transformation as it slowly transitions to more exclusive web-only content, in line with the shifting tendencies of journalism worldwide. Along with the 5000 physical papers circulated around the UVic campus and the local community, The Martlet has over 3500 followers on Twitter and 1700 followers on Facebook. www.martlet.ca receives an annual average of 30 000 audience members via organic web search, and 17 000 audience members via social media channels. Martlet stories are regularly picked up by larger publications including the CBC, CTV News, the Times Colonist, and Chek News. Cadborosaurus is a mythical sea serpent in the folklore of regions of the Pacific Coast of North America that is rumored by students to live in Cadboro Bay, adjacent to the University Of Victoria. The Cadborosaurus, or 'Caddy' as he is colloquially named, has become a favourite for students. Notable among a number of songs commonly played and sung at various events such as commencement and convocation, and athletic games, is 'Rack and Ruin', a reminder of the tradition of the founding Victoria College. Finnerty Gardens is an extensive series of sculpted gardens maintained on campus. UVic maintains an extensive series of sculpted gardens on campus which serve as a place of respite and peace for students, staff, and members of the public who visit them. The Garden's include some of the largest collections of West-Coast plants and are cared for by the Friends of Finerty Gardens, a charity which raises funds and helps support the garden's growth. The Finnerty Gardens include ponds, trails, flower gardens, and benches throughout. The University Multi-Faith Centre is nestled neared the gardens. The martlet and its red colour adorn many parts of the University of Victoria, including the crest, coat of arms, and flag representing the university's previous affiliation to McGill University which also uses the martlet. The legendary martlet bird's inability to land is often seen to symbolize the constant quest for knowledge, learning, and adventure. The oldest student newspaper on campus, The Martlet, is named after the bird. UVic Orientation/Weeks of Welcome takes place each year for all new students to the school. UVic Orientation includes events, activities, and workshops to help students adjust to university life. The main event of UVic Orientation, which takes place on the day immediately preceding the first day of classes, has gone by a number of names over the years. This event is currently referred to as New Student Welcome, and is UVic's largest Orientation event. The University Club is a private club located on campus. Membership is limited to faculty, staff, students, and alumni. The University Club of Victoria is a private club located on the campus of University of Victoria. Faculty, Staff, and students are all members of the club and outside organization may also use the dining halls, meeting rooms, and other facilities. Alumni of the university often become members as well. The catering staff host dinners and awards celebrations frequently and the Holiday Roast Pig is a classic event on campus. The University Club (formerly called the Faculty Club) opened on March 16, 1982. The west coast design and cedar construction of the building lends itself gracefully to the natural picturesque setting in a wooded dale. The building, located on campus, is surrounded by high trees in a quiet, wooded area. Artistic landscaping with flowers and shrubs blooming year round are reflected in the adjacent pond. The University of Victoria Students' Society is the second largest student society in British Columbia and represents the UVic undergraduate student body, plans campus wide events and operates the Student Union Building. The student society's leadership is elected annually during campus wide undergraduate student elections. As a multimillion-dollar organization, the UVSS is among one of the larger student unions which exist in Canada. The UVSS also negotiates with local government and healthcare providers for Student Transit Passes and health insurance. In 2014, the UVSS Student Union building underwent a major overhaul and renovation. In 2015, the University expanded and doubled the capacity of the public transit hub on campus which is adjacent to the Student Union building. In 2016, plans began for the fundraising and building of a new, much larger Student Union Building to accommodate the growing student population. The University of Victoria has one of the highest percentages of graduate and doctoral students in the country. The GSS offers services and academic support for UVic's 3,000 Graduate students. The society's services include the Grad House Restaurant, health and dental plan, funding for grad student events, and reduced-cost membership in the Victoria Car Share Co-operative. The McKinnon Building includes a triple gym and an indoor swimming pool. The building is used for recreational purposes by the student body. The Victoria Vikes (more commonly known as Vikes Nation) represent the university in a number of competitive sports, including rowing, sailing, rugby, and basketball. The Vikes have especially long ties to competitive rowing having competed for several international titles. Sailing remains an important sport at the university and the UVic Sailing Club (UVSC) maintains training facilities and boats at the nearby Cadboro Bay. Significant endowments, scholarships, and bursaries allow the university to recruit the best student-athletes, regardless of financial standing. UVic is a participating partner in the Canada West Universities Athletic Association (CWUAA) (the western division of ) and in the National Association of Intercollegiate Athletics (NAIA). Basketball games were traditionally played in the 2,500 seat, McKinnon Gymnasium which was built in 1975. An athletics facility was completed in 2015, which provides considerably more space and facilities for athletics. The $77 million Centre for Athletes, Recreation, and Special Abilities (CARSA), opened its doors on May 4, 2015. The University of Victoria is one of the top universities in Canada for competitive rowing. The UVic Rowing Crews are amongst the best in the world and frequently compete internationally for titles. UVic has long and eminent ties to its Rowing Program, and its maintains a boathouse on Elk Lake in Victoria, British Columbia. Rowers and student athletes are often awarded scholarships and training in specialized facilities in the new CARSA Athletics Building on Campus in Oak Bay. UVic Rowers are well known in Victoria and sometimes participate in the Dragon Boat festival in the Inner Harbour of Victoria, near the Legislative Assembly of BC. As the two oldest universities in the province, the University of Victoria (UVic) and the University of British Columbia (UBC) have long been fierce rivals in sports and athletics, including in Rowing, Rugby, and Soccer. The UVic Vikes and UBC Thunderbirds rivalry is a symbol of good sportsmanship, but has sometimes resulted in violence and less-than-polite behaviour by both sides. The "Annual UBC I UVic Soccer Classic" is one of the largest university sporting events in Canada and pits the UBC Men's Soccer Team against the UVic Men's Soccer Team. The annual classic alternates between the UVic Centennial Stadium and the UBC Thunderbird Stadium. Vikes Nation fans and UBC Thunderbird fans pack into the Centennial stadium for the classic, with the UVic Cheerleaders and Marching Band also present. In 2015, UVic also constructed a new and expanded Athletics Facility (CARSA) which includes a major auditorium/gymnasium for Vikes Basketball and Volleyball Teams, and significantly more seating, stands, and court facilities. Constructed in 1967, Centennial Stadium is one of the largest stadiums used by any university in British Columbia. The Centennial Stadium is a historic stadium located on the campus of the University of Victoria in Victoria, British Columbia, Canada. The large facility was built as a 1967 Canadian Centennial project to celebrate the 100th anniversary of Canadian confederation, but has undergone many repairs and upgrades since then. Today, it is one of the largest university stadiums in British Columbia and is home to the UVic Vikes. UVic has 25 sport clubs that are administered by Vikes Recreation and run by students. Jeff Mallett, former president and chief operating officer of Yahoo! The asteroid 150145 Uvic was named in the university's honour on 1 June 2007. UVic was the first university in BC to have an asteroid named for it. ^ "History". uvic.ca. University of Victoria. Archived from the original on 25 September 2017. Retrieved 24 September 2017. ^ a b "The University of Victoria Foundation". University of Victoria - University Secretary. Retrieved April 12, 2019. ^ "Shelagh Rogers named as UVic's next chancellor". ring.uvic.ca. 2014-05-29. Archived from the original on 2015-01-23. Retrieved 2015-01-22. ^ "Cassels takes oath, installed as UVic's new president". ring.uvic.ca. 2013-11-12. Archived from the original on 2015-01-23. Retrieved 2015-01-22. ^ "Provost's bio". uvic.ca/vpacademic. Retrieved 2015-01-22. ^ "University of Victoria – Facts and reports" (PDF). Uvic.ca. 2014-08-01. Retrieved 2015-01-22. ^ a b c d "Annual review" (PDF). www.uvic.ca. 2017. ^ "University of Victoria". The Canadian Encyclopedia. Retrieved April 13, 2019. ^ Henry Marshall Tory. Ualberta.ca. Retrieved on 2013-07-12. ^ "Judicial appointments for three UVic Law alumni". University of Victoria Law School. Retrieved April 13, 2019. ^ "The Honourable Jody Wilson-Raybould Bio". Canadian Council for Aboriginal Business. Retrieved April 13, 2019. ^ "Executive Profile: Jeffrey Mallett". Bloomberg L.P. Retrieved April 13, 2019. ^ "Andrew Weaver". The Canadian Encyclopedia. Retrieved April 13, 2019. ^ Kane, Laura (April 14, 2017). "For B.C. Green Party Leader Andrew Weaver, politics is a science". The Globe and Mail. Retrieved April 13, 2019. ^ "Ocean Networks Canada". www.oceannetworks.ca. Retrieved 23 January 2015. ^ "Facts & figures - University of Victoria". Uvic.ca. Archived from the original on 2012-01-23. Retrieved 2012-01-10. ^ a b c d P. Anisef And J. Lennards. "Universities in Canada (Canadian Universities)". The Canadian Encyclopedia. Retrieved 2012-01-10. ^ a b c d Terence Bailey; Philip M. Wults; Sarah Church (1985-08-31). "Thecanadianencyclopedia.com". Thecanadianencyclopedia.com. Retrieved 2012-01-10. ^ "The Castle". Craigdarroch Castle. Archived from the original on 2014-02-22. ^ "Arms and Badge". Archive.gg.ca. 2005-07-28. Retrieved 2012-01-10. ^ "University of Victoria Maps, Buildings and Directions". uvic.ca. Retrieved 23 January 2015. ^ "University of Victoria campus maps and building directory (A-Z)". uvic.ca. Retrieved 2012-09-19. ^ "Army Huts Registry of Historic Places of Canada". Historicplaces.ca. Retrieved 2012-01-10. ^ "Faculties, divisions and departments". Retrieved 28 August 2015. ^ "Craigdarroch Residences (1964 and 1967)". University of Victoria Art Collections. Retrieved 2013-01-30. ^ Hill, Edward (November 15, 2013). "UVic swaps parking spaces for bike centre". VicNews. Retrieved 17 November 2013. ^ "University's bunny battle intensifies". CBC News. May 20, 2010. ^ "University of Victoria, Victoria, British Columbia, Canada, Rabbits at UVic". Communications.uvic.ca. Retrieved 2012-01-10. ^ "UVic rabbits have left Coombs for Alberta". pqbnews.com. Retrieved 2016-04-01. ^ "University of Victoria - Library Services - University of Victoria". Uvic.ca. Retrieved 2012-01-10. ^ Duffy, Andrew A. "Room for UVic students in Broad Street redevelopment". ^ "Ranking Canada's law schools - Macleans.ca". Macleans.ca. 2009-09-18. Retrieved 2017-05-24. ^ "Peter B. Gustavson School of Business | the University of Victoria | Victoria, BC, Canada - University of Victoria". www.uvic.ca. Retrieved 2017-05-24. ^ "Science". Science. University of Victoria. Retrieved 17 November 2017. ^ "Programs". Social Sciences. University of Victoria. Retrieved 23 January 2015. ^ "Peter B. Gustavson School of Business". uvic.ca. Retrieved 23 January 2015. ^ "AACSB International". Aacsb.net. Retrieved 2018-06-09. ^ "Choose your path around the world - University of Victoria". www.uvic.ca. ^ "Engineers Canada – Accredited Engineering Programs". Engineerscanada.ca. Archived from the original on 2010-05-14. Retrieved 2012-01-10. ^ "University of Victoria Engineering Department". uvic.ca. Archived from the original on 2015-03-24. Retrieved 2017-08-21. ^ "Faculty of Fine Arts - University of Victoria". UVic.ca. ^ "Faculty of Humanities - University of Victoria". UVic.ca. ^ "Humanities". uvic.ca. Retrieved 23 January 2015. ^ "Ranking Canada's law schools - Canada". Macleans.ca. 2009-09-16. Archived from the original on 2012-01-10. Retrieved 2012-01-10. ^ "Ocean Network Canada". www.oceannetworks.ca. Retrieved 23 January 2015. ^ "Bamfield Marine Sciences Centre". www.bamfieldmsc.com. Retrieved 23 January 2015. ^ "School of Public Administration". uvic.ca. Retrieved 23 January 2015. ^ "Home". Continuing Studies at UVic. ^ "British Columbia & Yukon Secondary Schools Admission Requirements". Registrar.uvic.ca. 2011-08-04. Retrieved 2012-01-10. ^ "Canada's Top 50 Research Universities 2018". Research Infosource. 2018. Retrieved 12 March 2019. ^ "School of Earth and Ocean Sciences - UVic". Seos.uvic.ca. Retrieved 2012-01-10. ^ "University of Victoria - UVic Law". Law.uvic.ca. Retrieved 2012-01-10. ^ "Startup funding help Victoria | VITP". Vitp.ca. Retrieved 2012-01-10. ^ "UVSS Annual General Meeting Minutes 2010" (PDF). University of Victoria Students' Society. October 14, 2010. Archived from the original (PDF) on April 2, 2015. Retrieved March 12, 2015. ^ "UVic startup sorority not swayed by opposition". The Globe and Mail. December 15, 2010. Retrieved March 12, 2015. ^ "History | Office of Greek Affairs". www.greek.iastate.edu. Archived from the original on 2017-09-30. Retrieved 2017-12-11. ^ "University of Victoria - Maps and buildings - University Club (UCL) - University of Victoria". UVic.ca. ^ "University of Victoria - Maps and buildings - McKinnon Building (MCK) - University of Victoria". Retrieved 28 August 2015. ^ "Athletics and Recreation Project: Frequently Asked Questions". University of Victoria - UVIC Communications Media. Archived from the original on January 9, 2015. ^ "Centre for Athletics, Recreation and Special Abilities". University of Victoria. Retrieved April 13, 2019. ^ "Vikes Recreation Programs – University of Victoria". Sports and Recreation Clubs. Retrieved 17 February 2014. ^ "Ring.uvic.ca". Ring.uvic.ca. Archived from the original on 2012-02-05. Retrieved 2012-01-10. ^ a b "Communications.uvic.ca". Communications.uvic.ca. 2005-02-22. Retrieved 2012-01-10. ^ "Hal Lawrence fonds". University of Victoria. Archived from the original on 2012-07-12. Retrieved 2010-05-29. ^ Reid, Michael D. (January 27, 2009). "Her debut was gory, but it was Canadian". Times Colonist. Retrieved March 15, 2018 – via PressReader.com. ^ "Careers in psychology - University of Victoria". UVic.ca. Retrieved 2017-05-19. ^ "Flickr Co-Founder Among UVic Legacy Awards Recipients" (Press release). University of Victoria. November 17, 2008. ^ Livingston, Jessica (2008). Founders at Work: Stories of Startups' Early Days. Apress. p. 257. ^ "The Ludicorp Team". Ludicorp. Ludicorp Research & Development Ltd. Archived from the original on 2003-10-26. ^ "C3dsp.westjet.com". C3dsp.westjet.com. 2010-11-01. Archived from the original on 2009-08-30. Retrieved 2012-01-10. ^ "The next big thing in comedy? It just might be this deadpan B.C. business grad". The Globe and Mail. Toronto. 2013-03-11. ^ Name (e.g. Bill Gates). "Forbes.com". Forbes.com. Archived from the original on February 18, 2008. Retrieved 2012-01-10. ^ Ebner, David (11 November 2011). "Sell out? No thanks, HootSuite founder Ryan Holmes wants a legacy". The Globe and Mail. Retrieved 29 August 2013. ^ "The Founders". Retrieved 28 August 2015. ^ Fin Donnelly | Fin Donnelly. Findonnelly.ca. Retrieved on 2013-07-12. ^ "Communications.uvic.ca". Communications.uvic.ca. 2007-05-31. Retrieved 2012-01-10. Wikimedia Commons has media related to University of Victoria.